Marca give their take on the Denis Suarez situation and it’s a calm look which sets the scene of what’s happening. Barcelona president Josep Maria Bartomeu is said to be negotiating with Arsenal and has assured Suarez that he’ll find a way to make a transfer happen in the winter window. However, as has been covered for a few days now, there’s a ‘money problem’. 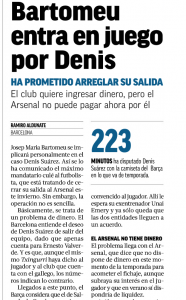 Marca explain Arsenal have told Barcelona they have no funds to make a full transfer in the January market. Barca aren’t prepared to give their player away and estimate they can get between ten and fifteen million Euros. That obviously doesn’t sound a lot in the current transfer market, and especially when compared to what Everton paid for Lucas Digne and Yerry Mina in the summer, but it’s still too much for the Gunners who are pretty described as pleading poverty. Arsenal are the ‘only’ club who can take Suarez and Unai Emery ‘awaits’ the player’s arrival. Given all of that, it’s explained a loan with a compulsory purchase option seems the ‘most viable option’.